There is a fortuitous intersection between my first, and to date, only attempt to capture a memoirish reflection on the page, and Scott Abbott’s memoirish reflection, Immortal for Quite Some Time. My Minor Literature[s] essay was published a year ago this past May, just as Scott was proofing his book. I followed that process via his blog, The Goalie’s Anxiety. We shared concerns about opening oneself to strangers. When my small piece went live, his reaction was so immediate and gut-level, that I returned to his positive words repeatedly in the weeks that followed. Now, my reading and my attempt to record my reaction to his finished book comes at a time when I am seriously beginning to build on the project that started with my initial essay and flesh out a life twice lived—my own. And although, on the surface, the circumstances driving our explorations would seem very different, both involve fundamental, human questions of identity, belief, and family. As a result, my reading of this work is decidedly idiosyncratic. It is this disclaimer that promises an honesty that respects all the shadowed corners one encounters looking into a life lived—whether that is someone else’s life or one’s own. Immortal opens in the morgue in Boise, Idaho. The image of John’s body on the examination table forms a stark pivot point that his brother’s thoughts return to again and again: “His feet are livid.” From there, the narrative swings back to Farmington, New Mexico, 1950, midpoint between the births of Scott and John, only fourteen months apart, and moves, with broad strides, through the 50s, 60s and into the 1970s. Scott’s missionary obligations and academic aspirations take him to Germany, where an intellectual infection will begin to work its way into the assumptions and presumptions of his strict Mormon upbringing. John will go to Italy and, for years, his family will speculate if that is where he was “corrupted,” or whether he was “lured” into homosexual behavior at some earlier point. One of Scott’s first steps to reconciliation and acceptance of John’s orientation will involve coming to understand that sexuality has a biological basis. Not that that understanding provides a desired comfort with his own, decidedly heterosexual, attractions for many years. Scott’s belief in God slips away from him much more readily than his homophobia. However, he continues to uphold the expectations imposed on him by his background. He marries young and before long is supporting a brood of seven with a teaching position at Bringham Young University. John, despite strong grades and an interest in pre-med studies, ends up working as a cook in a series of cafés. His contact with his family is limited and strained. His notebooks reveal little about his personal life. Abbott is clearly troubled by his brother’s isolation and sadness. It was not easy to be gay in the 1970s and 80s, but coming from an uncompromising religious tradition made it much more difficult. It still is today. Throughout this work, John is a memory, a ghost, as much as a loved and lost brother and son. As readers, we only hear his voice filtered through time. See him peering from old photographs. In that sense, Immortal for Quite Some Time, reads like a fraternal love letter, an apology, and a reckoning. Scott Abbott is wise enough to know that the only story he can really tell is his own. And it is a fascinating, raw, and honest exploration of the intellectual, emotional, and political conflicts that have made him the man he is today. As his story progresses, a critical voice intervenes to challenge his recorded recollections, forcing him to answer and clarify his statements. Toward the end John is also granted a greater presence. (The use of italics, bold type and font facilitates these imagined exchanges in a manner that is simple and effective.) This is more than stylistic device. It is a reminder that we can never and should never stop questioning ourselves even in telling our own stories. It is a good lesson for me to keep in mind too. As I made my way through this book, I encountered many questions I need to ask myself in piecing together my story. I do not come from a rigid religious background, but in my case I am the outcast, the one set apart by sexuality and gender. I sought to conform to a different, but equally confining set of rules and expectations. I mourn the loss of a sibling, a stillborn sister I never had, and the imagined image of her that I could not be. The person I have to answer is myself, finding the courage to ask the question is my goal. That will require a memoir of some kind. Just as, in spite of himself, Scott Abbott ended up with a memoir of sorts to answer his brother. 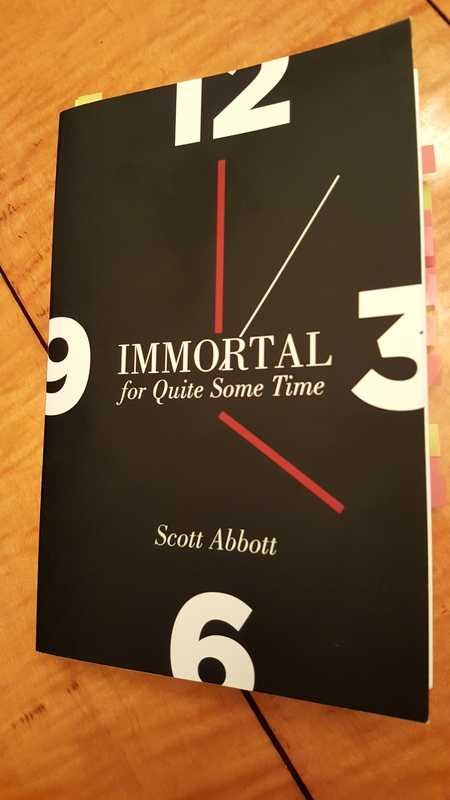 Immortal for Quite Some Time is published by The University of Utah Press. This is fascinating! Scott Abbott was a fellow graduate student with me at Princeton in the 1970s, in the tiny German Department. We haven’t seen each other in decades, and I hope to read his book! It is a small world! I hope you get a chance to catch up. Hi Shelly. I have followed your translating work and am pleased to encounter you here again! One of my friends teaches memoir, and she says it is one of the hardest forms to write in because it requires honesty. It needs the writer to be him/herself. But the problem is that sometimes we do not always really know who we are, as in the case of this author who clearly traces a journey where he’s not even sure that he can be friends with his brother because of the entanglements of religion, family, and the external culture of the time. It sounds like a very sad book. This is a very honest work, and it avoids becoming too sad or self-pitying because Scott has taken the time and distance necessary to tell the story properly. In the end it is powerful and life-affirming without being maudlin. Somehow I missed this review, Joe. And now a book to look for. You’ve sent me in search of it, the best kind of guide. Hope you enjoy it Theresa! Beautifully expressed. And I love the story of your returning to his words for encouragement to continue along the road of unfolding parts of yourself on the page. Blogging, reviewing and literary Twitter has introduced me to writers I never would have met. It’s a great way for writers to connect and support one another.